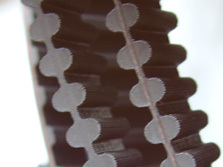 These belts have teeth on both sides to provide synchronization from both driving surfaces. 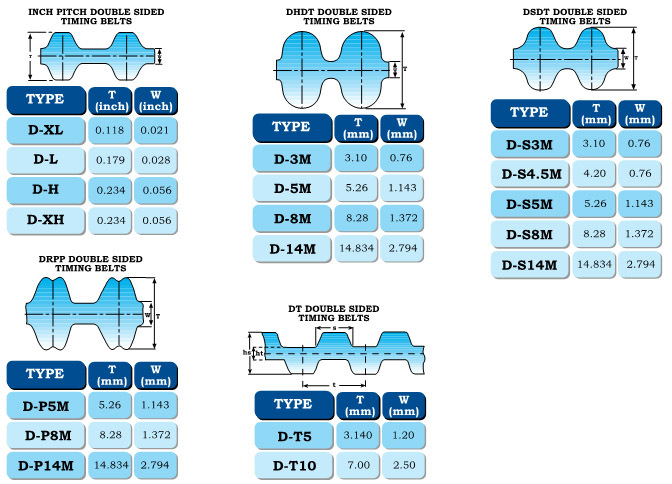 D&D SYNCHRO*POWER timing belts are suitable for many applications including data storage, hand power tools, postage handling, food processors, Office machines, centrifuges, Money handling, madical diagnostic, sewing machines, ticket dispensers, robotics, vending machines and vacuum cleaners. These belts features; provide equal load carrying capacities with naylon fabric on both surfaces, belt capacity is equal to standart single-sided timing belts, fiberglas tensile cord provides high strength, excellent flex life, and highresistance to elongation. Neoprene body provides protection against, grease, oil and moisture.